A wreck near the Waynesville Rural Fire Protection District station on Highway 28 blocked traffic Tuesday. PULASKI COUNTY, Mo. (Oct. 27, 2015) — Emergency service personnel spent much of Tuesday rushing from wreck to wreck, dealing with crashes on Highway 17 north of Waynesville at the junction of Longview Lane leading to the Shalom Mountain/Northern Heights Estates residential subdivision, on Highway DD and Buttercup Road south of Crocker, and on Highway 28 near the Waynesville Rural Fire Protection District fire station. Outside the immediate area, a Polk County crash in Halfway injured a Richland man. 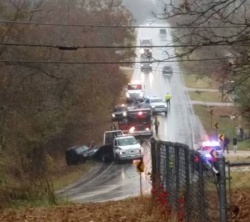 According to Missouri State Highway Patrol reports, Madison Nickels, 16, of Crocker, had been driving westbound three miles southeast of Crocker at 7:45 a.m. when she ran her 2008 Mazda 6 off the right side of Highway DD, overcorrected went back across the road and off the left side, struck an embankment and overturned. Nickels and two passengers, Bailey A. Nickels, 15, and Isaac L. Nickels, 11, all of Crocker, suffered minor injuries and were transported to Mercy Hospital in Lebanon, Madison Nickels by Pulaski County Ambulance District personnel and the others by private vehicle. All had been wearing their seatbelts. According to Crocker Fire Protection District reports, Crocker police and Pulaski County sheriff’s deputies also assisted at the crash scene, with firefighters returning to their station with one engine about 9:30 a.m. Nickels’ car was extensively damaged and removed by Roy’s Towing. Waynesville firefighters and state troopers responded shortly after noon to a wreck on Highway 28 at the curve between the now-closed Moats Auto Body and the Waynesville Rural Fire Protection District substation. While the crash didn’t cause injuries, a vehicle ended up in the ditch on the west side of the roadway and blocked traffic until it was removed. Later Tuesday night, emergency personnel responded to a 9:20 p.m. wreck on Highway 17 at Longview Lane on which Christina Flores, 18, of Waynesville, was driving a 2006 Mercury Mariner northbound, ran off the right side of the roadway and struck an embankment before coming to rest. Flores, who had been wearing her seatbelt, suffered minor injuries and was transported by Pulaski County Ambulance District personnel to Phelps County Regional Medical Center in Rolla. Her vehicle sustained moderate damage and removed by Anybody Towing. Outside the county, troopers reported that Richard L. Balsley, 54, of Richland, had been driving eastbound on Highway 32 in the Polk County community of Halfway when he crossed the centerline at 12:40 p.m. and his 1994 Mercury struck a westbound 2008 Ford driven by Tabitha A. Wendt, 19, of Buffalo. Both vehicles ran off the north side of the roadway with Balsley’s vehicle striking a fence and Wendt’s vehicle overturning in the ditch. Wendt was not hurt but both Balsley and Wendt’s passenger, Barbara A. Horsman, 38, also of Buffalo, suffered minor injuries and were taken to Citizens Memorial Hospital in Bolivar. All three had been wearing their seatbelts. Balsley’s vehicle sustained moderate damage and was removed by B&B Wrecker of Bolivar. Wendt’s vehicle was totaled and removed by Wade’s Towing of Bolivar. Balsley had no proof of insurance, according to state patrol reports.